I get a big kick out of mentoring students, you learn a lot about yourself and in my case, have the opportunity to selfishly spread the Eclipse love. My first experience in remote student mentoring was with Remy Suen two years ago and I have improved my technique a bit (sorry for you being the guinea pig Remy ;p). One of my students (Rafael) this summer in the GSOC program has been working on the Declarative Services tooling in the PDE incubator. With those tools installed, you get a better idea of what needs to be done (via Mylyn) and also the current code coverage (via EclEmma). 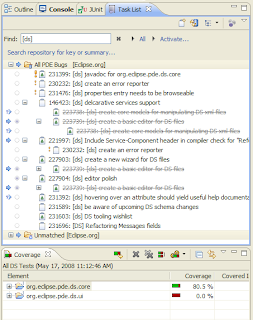 We have been able to move faster with these tools installed towards our goal of having a nice and shiny Declarative Services editor in Eclipse. This wouldn’t be possible without the extensive set of tools available in the Eclipse ecosystem. So feel free to spread the Eclipse love and show any students (or colleagues) some of the cool tools you’re using in Eclipse to improve your workflow.